Captain P is my Habitat user name. I have 3268 Habitat points which places me in 45th position on the leader board. A couple of weeks back I received an email from 7 year old Madeline telling me she loved the game and she was top of the leader board with over 5000 points. I can’t see Madeline from my position but I am sure she has racked up many more points by now. – 5181 balloons of carbon. So what does this mean? It is the team at Integrated Sustainable Analysis at Sydney University who have up with the algorithms and our measurement tools. 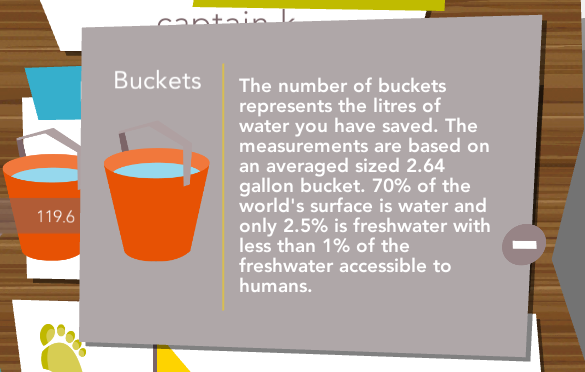 The number of buckets represents the litres of water based on an averaged sized 10 litre bucket or 2.64 gallons. The number of footprints represents the area of land that a player has NOT disturbed by their actions. 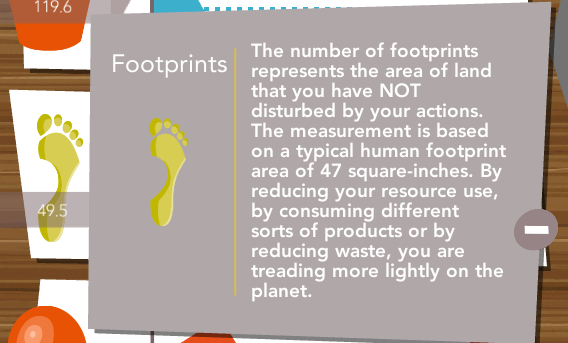 The measurement is based on a typical human footprint area of 300 cm2 or 47 square-inches. 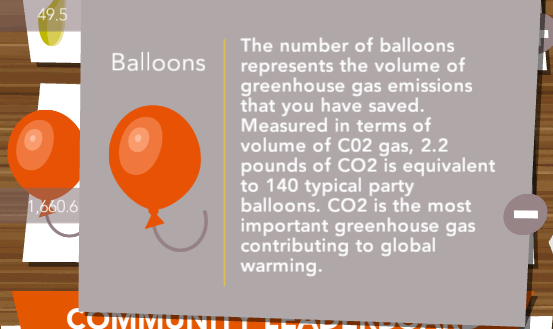 The number of balloons represents the volume of greenhouse gas emissions measured in terms of volume of C02 gas, 1 kg or 2.2 pounds. Remember all of these actions are based around rewarding players when they are under the national average. I could keep calculating to tell you that each gallon of gas you put in a car produces 14 pounds of carbon dioxide. 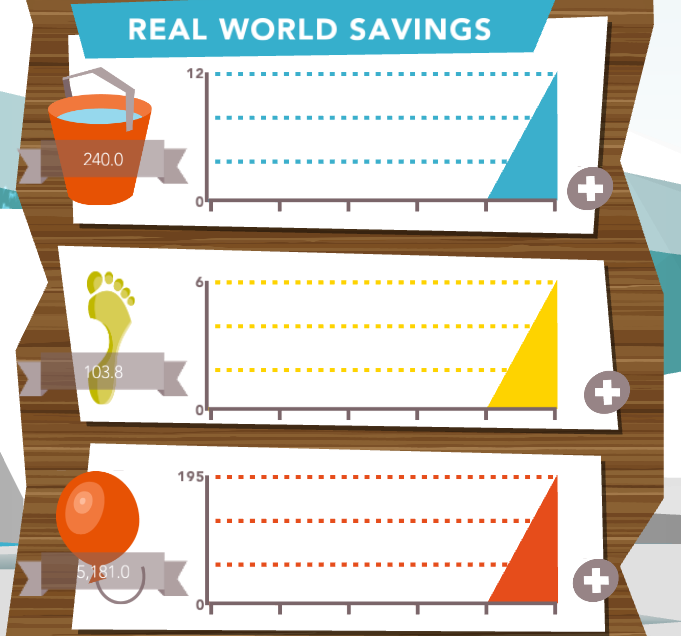 My behaviours equate to about the equivalent savings of over 800 gallons of gas. And who said kids can’t make a difference? It is going to take top down and bottom up approaches to address global issues like climate change and we need our kids to know they can be part of the solution. Habitat has enjoyed it’s first month in the hands of players young and old. Lachie found Habitat on my phone, he loves it!! When he gets a turn on my phone he’s choosing Habitat over Minecraft! Given that he only has about 30 minutes a day on an ipad, habitat held its own against games like clumsy ninja, and lego star wars for play time. Will loves Habitat. He has taught his siblings and neighbours how to play. Will has a life’s amount of ‘screen time’ each week but he manages to check on his bear – and if he doesn’t his brother or sister do! It has been great to see some of Habitat’s lessons put into action in our home – shorter showers, lights turned out and a keenness to recycle their old toys and clothes. I liked taking care of the bear and feeding it so I knew the bear was healthy and could have a baby. I liked the swimming in the Arctic looking for fish. Habitat allows a child to imagine and create with a positive environmental focus. This is the best app of it’s genre. It is a positive and challenging experience for children. It encourages children to think about the environment and the positive choices they can make as independent thinkers. I soooooooooooo like your game I am the leader. I have 4594 points already.